Gov. 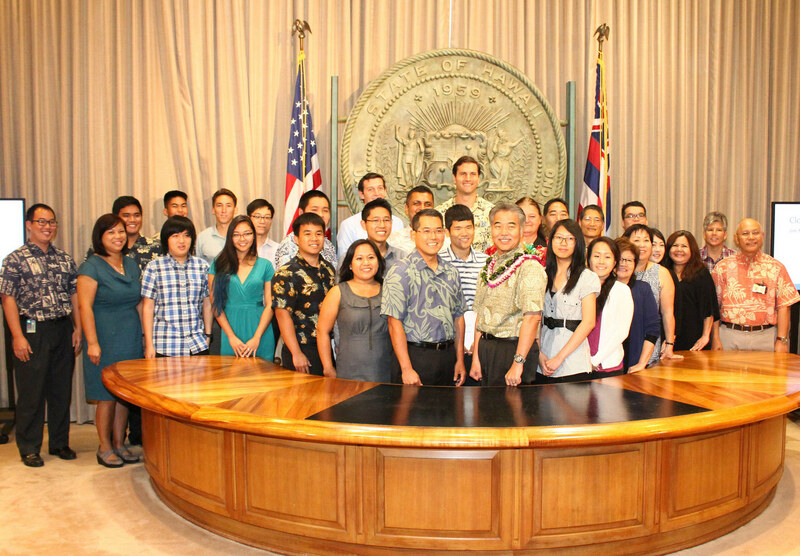 David Ige with TIP Summer 2015 interns, coordinators and project sponsors. 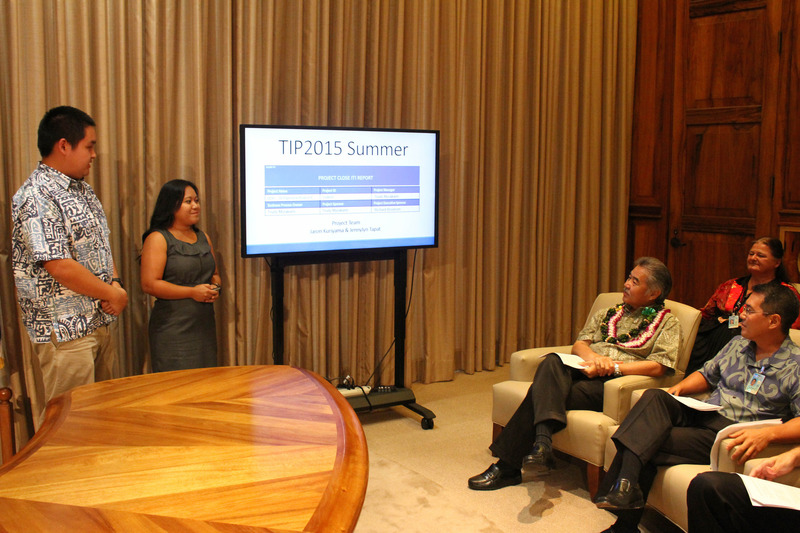 HONOLULU – Upon the completion of the state’s Transformation Internship Program (TIP) summer 2015 session, Gov. David Y. Ige recognized participants in a ceremony held today at the Hawaii State Capitol. 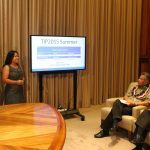 State interns Jaron Kuriyama and Jennylyn Tapat summarize for Gov. David Ige and OIMT IT Operations Officer Jim Miwa the students’ contribution to a Department of Health “paperless” project. The Office of Information Management and Technology (OIMT) launched the nationally recognized program in partnership with the state Department of Human Resources Development in spring 2013. 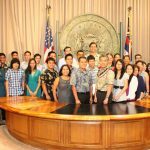 TIP provides Hawaii undergraduate and graduate students the opportunity to work alongside innovators within state government and gain hands-on experience in a wide range of areas. Students work collaboratively in teams to advance transformation initiatives. This semester’s participants worked on various IT projects with the Departments of Agriculture; Business, Economic Development and Tourism; Health; and Public Safety; as well as OIMT and the State Procurement Office. Projects ranged from paperless initiatives, to database modernization, to program management process training. In 2014, TIP earned national recognition as the StateScoop “State IT Program of the Year,” an award which honors influential IT programs that have led to cost savings, efficiencies and partnerships between agencies.